CANNA Classic is the nutrient for cultivating plants in systems in which the drainage water is not returned to the nutrient tank but drains away. An advantage of these systems is that plants get fresh nutrients at each feed. This minimizes the risk of diseases. Also, the substrates used in these systems are mostly inert. This means they don't add or take nutrient elements from the nutrient solution, so you can grow with precision. These systems are called run-to-waste or open hydroponic systems. CANNA Classic is the nutrient that is most used for these systems. CANNA Classic Vega is a complete professional nutrient for the growing phase of plants. It is specially developed for growing in inert run-to-waste systems. In the beginning of the growing phase, the plant lays the foundation for its eventual yield. CANNA Classic Flores is a complete professional nutrient for the flowering phase of plants. 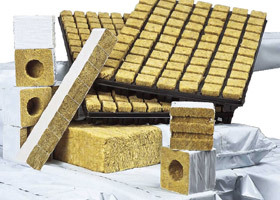 It is specially developed for growing in inert run-to-waste systems. This is CANNA's personal nutrient calculator. By entering data like your grow-system, the size of your feeding tank and water hardness it calculates a personal nutrients schedule. Don’t just measure the EC of the feed water and the drainage water regularly, remember to measure the EC of the substrate too.